Previously I wrote about The Four Horseman of the Apocalypse, four ways of communicating with your partner that don’t work. 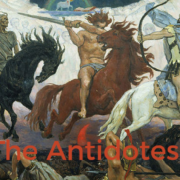 This blog is about the antidotes to the Four Horsemen. Once we become aware of these relationship killers we are then able to do something about it. Click here to for a reminder of the Four Horsemen. Horseman #1 (Criticism) Antidote – Gentle Start-up: According to Gottman the first three minutes of a conversation will determine how the conversation will go. A harsh start-up is usually the result of emotions that make one want to withdraw from the world. Instead of allowing these vulnerable emotions to be seen, we tend to cover them up with criticism and contempt. If we allow our partner to hear these softer, more vulnerable emotions the communication will be easier to hear and lead to more productive communication. There are 5 elements to the Gentle Start-up. Give appreciations. Acknowledging what your partner is doing right is the takeaway here. If you are thinking that nothing is going right, you can specifically ask for what you need while being appreciative of how your partner was in the past. Horseman #2 (Defensiveness) Antidote – Take Responsibility: By taking responsibility for even a small part of the problem you defuse tension and help to keep the problem from intensifying. Taking responsibility also helps your partner feel heard and understood. Horseman #3 (Contempt) Antidote – Describe Your Own Feelings and Needs: The implication when one partner is being contemptuous is that a desire, a need, or a want is not being fulfilled, and likely hasn’t been fulfilled for a while. The antidote is to describe your own feelings and needs by using “I” statements. (See ‘Gentle Start-Up’ for Criticism I Feel…/About What…/I Need…) Overall the idea is to share a spirit of appreciation with your partner. When you feel valued and appreciated you are able to access positive feelings for your partner and are less likely to act contemptuously when there is a difference of opinion. Horseman #4 (Stonewalling) Antidote – Do Physiological Self-Soothing: The antidote to Stonewalling is to take a self-soothing break for at least 20 minutes. Instead of Stonewalling in reaction to your partner, you recognize the need to think clearly and to calm down. Tell your partner you will be back in 20-30 minutes to discuss the issue. Avoid negative self-talk during your break. Participate in something that is self-soothing, possibly going for a walk, or listening to music, there are also many relaxation techniques available online. When you do return to the discussion your partner is careful to talk in a gentle way so you can both engage in a constructive discussion. There you have it. The Antidotes to the Four Horseman. I hope you find you are able to make use of them in your relationship. It is unrealistic to think the Four Horsemen will never show up in a relationship. But repairing and using the antidotes is critical in strong and happy relationships. If you are interested in exploring how these ideas relate specifically to you and your partner I would be happy to discuss them further with you. Please use this link to contact me, or you may call 314-722-8255.